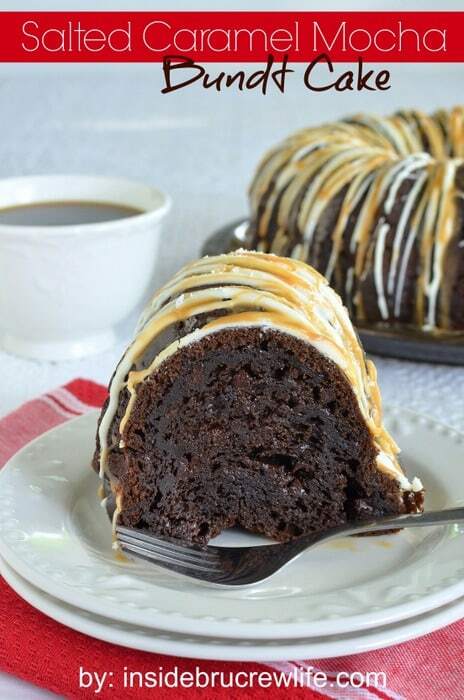 This Salted Caramel Mocha Bundt Cake is the perfect over the top chocolate cake for any picnics or dinner parties you go to. Make it and impress the pants off all your friends. My day always starts off with a hot cup of coffee. It can be 90* outside and I will still brew that hot cup. My brain just doesn’t function without that caffeine jolt. And for some reason iced coffee doesn’t get me going the same way a steaming cup does. Recently I was sent a Keurig coffee maker to try out. That got me so excited to drink lots of fresh coffee throughout the day. Normally my husband would brew a pot of regular dark coffee and take what amount he wanted in a travel cup to work, Then I would need to clean out the grounds, and brew my pot of decaf coffee. I would then drink one cup and leave some in the pot for later. Yes, I would drink microwave coffee in the afternoon. It wasn’t great, but it was easy. I love that the Keurig brews a fresh cup of coffee in 30 seconds. No more waiting for the pot to cool off so I can make another kind. It also has so many different kinds of drink options. I may start the day with hot coffee, but by mid-afternoon I like a cold coffee drink. There is a huge variety of coffee’s, tea’s, and hot chocolate’s to choose from. I really love the brew over ice varieties that have the sweeteners already in them. The sweet and creamy iced coffee and the peach tea are a few of my favorites. The Keurig is so easy to use that my daughter will usually ask me if I want another cup of coffee because she wants to make it for me. Actually I think she just wants to make herself a cup too. Some days I make her day by brewing the largest cup size and letting her have a small cup with some creamer. Another fun way to use the coffee that is brewed is through baking. I love to substitute cooled coffee in place of the liquids in cakes and frosting. In this particular cake, you can’t taste a coffee flavor in the chocolate. The coffee just deepens and enhances the chocolate. And let’s face it, anything to make chocolate better gets an A+ in my mind. This cake is for the serious chocolate lover. It has an extra box of chocolate pudding and mini chocolate chips added to it. 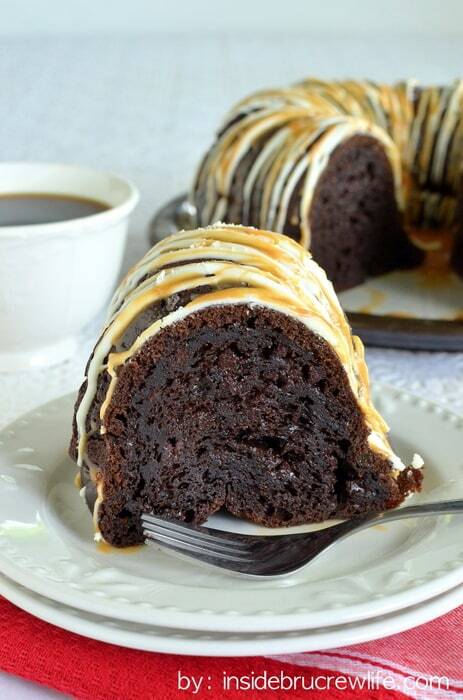 My all time favorite coffee drink is a salted caramel, so I knew this salted caramel mocha bundt cake needed that flavor added to it. I drizzled some white chocolate over the top. Then I melted some caramel and added the sea salt to that. Sweet and salty truly gets me every single time. The caramel gets drizzled over the top and more sea salt is added for some texture. Are you a coffee drinker? 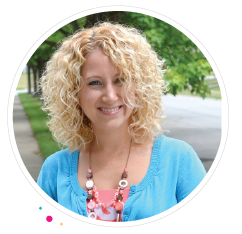 Today I am partnering with Aimee from Shugary Sweets to share about how much we love our coffee. 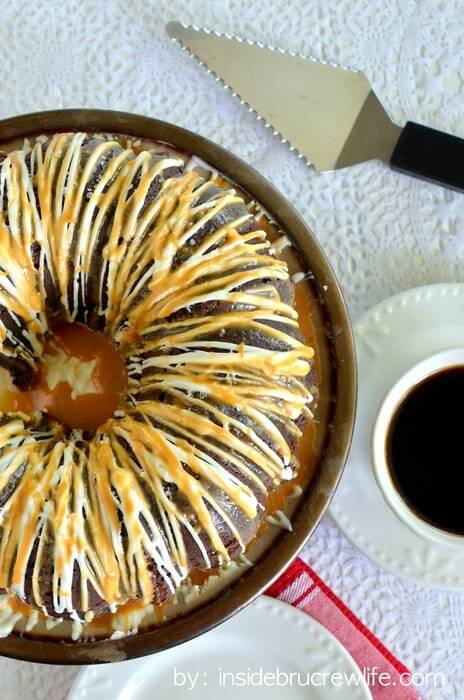 Head to Aimee’s page for this Cream Cheese Coffee Cake. 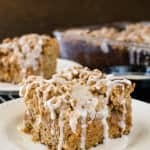 The amount of streusel on the top looks so insanely delicious! 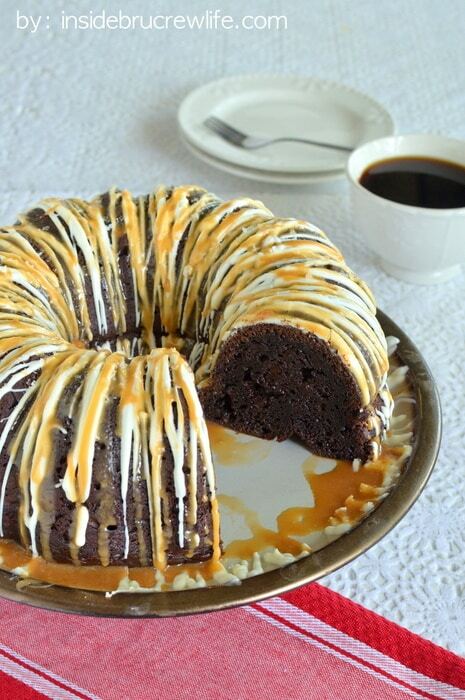 This easy Salted Caramel Mocha Bundt Cake is drizzled with caramel and white chocolate. Perfect fancy looking dessert for any party! Preheat the oven to 350 degrees. Spray a 12 inch bundt pan with nonstick baking spray. In a mixing bowl, combine the cake mix, pudding mix, sour cream, eggs, oil, and cooled coffee. Beat on low for 1 minute and then beat 2 minutes on medium. Stir in the chocolate chips by hand. Pour the batter in the prepared pan. Bake for 55-60 minutes. Let cool 15 minutes in the pan. Place a plate over the top of the cake and flip the cake over. Let cool completely. In a microwave safe bowl, place the white chips and shortening. Heat for 30 seconds. Stir until creamy. Place in a plastic baggie and cut one tip off. Drizzle over the top of the cake. Place the caramel bits and the heavy cream in a small saucepan. Heat on low until melted. Stir in 1 teaspoon of course ground sea salt. Drizzle the caramel over the chocolate. Sprinkle the top with the leftover sea salt. Cut into 16 wedges. Store in a sealed container on the counter. **This post also contains an affiliate link. We receive a small percentage from sales made through these free referral links. Thank you for letting us share products we love this way. I would make a dark roast coffee. I’m sorry, but a “Poke cake” is only “perfect” for a picnic..this bundt cake is just perfect for those “Fancy” dinner parties. I like coffee occasionally with flavored creams but I do not like coffee flavored cakes. What could I use instead of the coffee? You can just use water in place of the coffee. I hope you enjoy the cake!! What an awesome giveaway!! 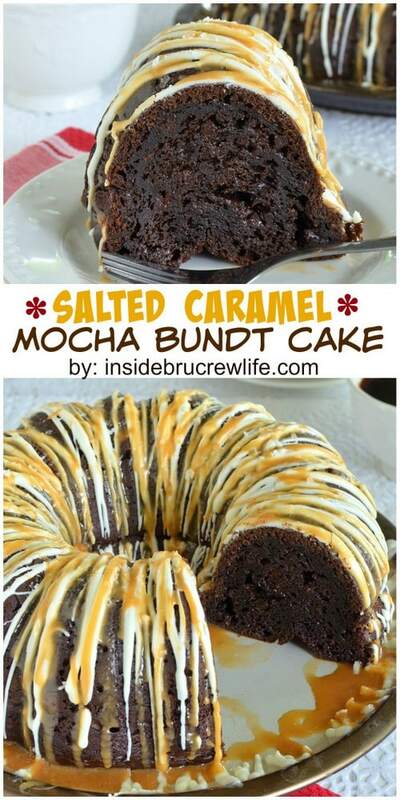 And the Salted Caramel Mocha cake looks DELICIOUS!!!! I love baking with coffee too! Anything cool over the summer works for me so the iced coffee and tea sound amazing! And that cake is stunning! This cake has everything I love in a cake!! Perfect!! Iced coffee or hot tea. I look forward to brewing mainly coffee, but also hot chocolate and tea for the whole family! I love that you can make more than just coffee with the keurig! Me too! Yay for Keurig and coffee! haha! Woo hoo! No kidding, iced coffee sounds really great too! I’ve never tried making it myself at home though! My family loves coffee, but I am a hot tea person, myself. My husband loves a mild coffee….black….. but my college-aged daughter and I love flavored coffees!!! 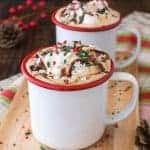 My youngest really loves her hot chocolate, so this would be wonderful! I’d take this cake to a picnic or a fancy dinner! It looks great, Jocelyn! Pinned. I’m looking forward to making different types of delicious coffee! I would love to be able to quickly brew a cup of coffee every morning before work! This cake is something I am going to have to make!!!!! I like anything made with coffee, and I drink so many cups a day!! So I don’t want to “assume” but is the coffee added with the liquids into the cake? I drink lots of coffee, but would love a Keurig so I could have a variety of coffees! It looks amazing! I would love to have a Keurig! I, like Vanda C., would also like to know where that cooled cup of brewed coffee is added. Coffee and chocolate are a marriage made in heaven; gotta make this cake! Caramel topping = nice touch. Love the versatility of the Keurig and have wanted one for years. Perfect appliance for one living alone. Thanks for the rapid reply; sort of guessed that the coffee would go just where you said it does. So looking forward to trying this decadent cake. Mmmmmm…this cake sounds wonderful! I love the chocolate and coffee combo! Your cake is just dripping with moistness and the icing and caramel. Whoa, you outdid yourself, Jocelyn! It’s gorgeous. I love adding coffee to my chocolate cakes, too. It brings out the flavor! Thank you so much Averie!! 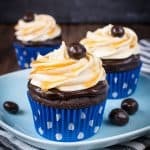 The coffee is totally a must in most chocolate cakes, and definitely in this one! 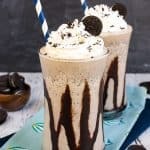 I would make the perfect coffee blend then add it to ice, milk and flavorings for the perfect frappe….topped with homemade whipping cream:) Of course, lots of exercise will have to follow, but it is soooooooo worth it! I would love to try keurig coffee’s. The cake looks delicious. Coffee and cake, great combination! We have a Keurig at work and I love using it to make my afternoon coffee…..so coffee would be the most exciting thing for me to brew in it!!! Adding coffee to cakes is a must! It helps the chocolate flavor shine! Your cake is beautiful and the icing dripping down looks to die for! This cake looks divine! Donut Shop is my favorite Keurig flavor. I look forward to trying EVERYTHING in a Keurig!! I would love to brew some flavored coffee (maybe hazelnut–yum!). Thanks so much. This would be fantastic – with two little ones, I could brew hubby’s coffee in no time. Thanks for the chance to win! I love coffee and the only one in my home who drinks it. A Keurig would be perfect! 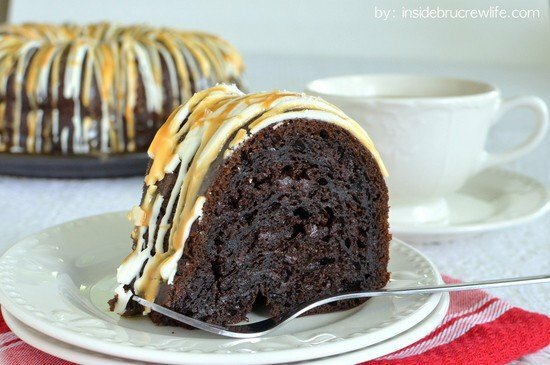 I love to bake and this bundt looks great!! Just might have to make it for my next family dinner. I love strong coffee in the morning and tea in the afternoon. Ice coffee is my fav for summer mornings, mid-mornings and afternoons! A cup of coffee would be PERFECT with this cake! And fresh from a Keurig would be even better! Wow I should not be looking at this right before lunch…looks incredible! Definitely a recipe I want to try. No no, don’t stop looking!! 😉 This cake would be fantastic for father’s day! That cake looks so soft and tender!! And I looove the top! Thanks!! 😉 It was REALLY good!! I’m a tea person, but this cake looks so delicious!!! And salted caramel… wow! Love it! I would make tea or hot chocolate, but I have a feeling that son No. 1 would be using it for coffee. A Keurig would be used for coffee for my spouse and tea for me. Great to have one appliance for both of us! I love every sort of tea! What a beautiful cake!! My husband does something similar for me. He makes one big pot of coffee in the morning, so he can have a cup before he leaves for work and bring some to work in one of his travel cups, and he leaves me just enough for one cup of coffee for me throughout the day. Believe it or not, in the nearly 10 years I’ve been married, I’ve never made coffee before. LOL-so this would probably be a great option for me! Plus sometimes I just need another cup of coffee throughout the day before I’m a stay at home mom who is also homeschooling-sometimes one cup of coffee just doesn’t do it for me, lol! I am a HUGE coffee lover and am always in search of a great rich bold cup of coffee. I used to drink all the flavored coffees but lately it’s just a great cup of coffee. My husband, on the other hand, a man who did not drink coffee when we met, now drinks an entire pot of his own each morning and he LOVES the flavored coffees. Because of that, I’m sure we’ll have a huge supply of all types in our home, including the hot chocolates too since our Granddaughter and her parents are living her. I am sure we’d take full advantage of the Keruig. I’ve wanted one for a very long time so I’d be thrilled to be the lucky person to win one. Butter Toffee Coffee, oh my goodness! My husband isn’t a coffee drinker, so a single-cup brewer is perfect for our household! I can’t start many day either coffee either. My fav is Starbucks Verona blend. I would brew both coffee and tea. Flavored for me and plain for the hubby. Hot coffee …. anytime day or night! I’d make tea and cocoa! I’m not a coffee person so I’d definitely use it to make some hot tea!! What I look forward to, other than hot coffee, which I have everyday is the iced tea & iced coffee. I can’t live without my jolt of caffeine in the morning either. I brew my coffee iced in the morning. This is one stunning cake! 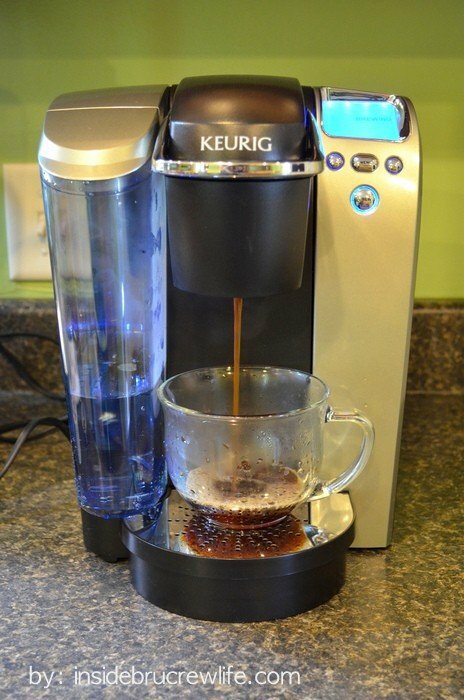 I would love to try Starbucks coffee with the Keurig! What a gorgeous cake! I’d be brewing coffee all day if I had a Keurig! I cannot wait to brew a Chai Latte!! I am the only coffee drinker in my house so a this would be a marvelous thing for me. I would brew a strong cup to pair with this delicious cake. I truly feel that coffee and desserts are a careful paring like a wine with a meal. Iced coffee! It’s the perfect summer drink! I would love a cup of iced coffee with a big slice of this gorgeous cake! Salted caramel is my favorite too! I always crave the flavor from starbucks, so it’d be perfect to eat it in the form of a cake. And I’m drinking coffee as I type this, so I think my addiction speaks for itself! I love me a deep dark roast coffee! Now how about that cake? Holy yummy! Iced coffee or tea for me, coffee for the hubs! Thanks for the recipe. It looks delish! While I think I would brew some regular coffee, I think I would do quite a bit of iced coffee and hot chocolate! I lost the Keurig in the divorce….I miss my Breakfast Blend Coffee. and I used dark roast for baking…loved having an assortment for when people came over. I would love a Keurig brewer! I would make all kinds of flavored coffees, iced coffee, and hot chocolate. I think everyone in my family would use it. I got TOTALLY addicted to the Keurig coffee over the weekend…it was so good and so easy that I couldn’t help going back for more! 🙂 It was awesome getting to meet you in person, Jocelyn! This looks and sounds so delicious! I would make dark roasted first! Yum! I like to always have a fresh hot drink! Love coffee in any way, shape or form!!! I want to try iced tea! Yeah, that looks amazing. So making this today. Pretty sure this recipe looks amazing! I’ve been wanting a Keurig and this opens up the possibilities even more!! I can’t believe how beautiful your bundt cake is!! Can’t wait to try it. 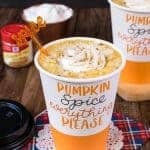 If I win the Keurig Platinum Brewer, I really look forward to brewing iced coffees and teas in the summer.. and flavored coffees in the winter!! It’s hard to say what would be my favorite, since I don’t have a Keurig yet I haven’t tried many of the great things you can brew with them!! The question would rather be what wouldn’t I make with it?? I have seen all of the flavors and varieties of brews to go in the Keurig, I would be in heaven. Coffee first.. then the rest. iced coffee in the summer and hot coffee on a cold morning in the winter! This looks crazy moist and superbly mocha-flavored–I can’t get enough of chocolate mocha cakes! I’ve just made a fudgy chocolate tunnel cake that has got me hankering for another chocolate-based dessert. Your recipe sounds great, especially considering the real dearth of moist, reliable mocha cake recipes out there. Thanks for sharing! Oh wow..all of the above! 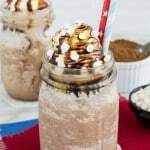 LOL…I LOVE iced coffee and that is so neat you can make that too! But..I love my coffee! I’d like to brew tea! Ugh!! I did something wrong trying post about my coffee…sorry. Disregard the previous comment, please. At any rate, I would brew a decaf coffee b/c I am still breast feeding my little guy. And being single, I could do a fresh cup later instead of warming my one cup up repeatedly in the microwave…AWESOME!! It can take me all day to drink one cup coffee, it’s sad. YUM…hot cocoa! Or even a mocha! I would make Iced coffee first if I won. This cake looks amazing! I look forward to brewing iced coffee in a Keurig. coffee for me and hot chocolate for the grand sons!!!!! I can’t wait to try the new Snapple drinks! I’m an iced-tea-aholic! This cake looks heavenly Jocelyn! I would totally be brewing up some of those Snapple Teas we tried at BlogHer – sooo good! The cake looks amazing and I love that it is made with a cake mix. I could make it gluten free! Maybe for our next church potluck. It is so much easier to transport a bundt cake than a layer cake. I would love a Keurig — have wanted one for a very long time. Thanks for the opportunity. I would be brewing coffee and tea. I would make Iced Coffee and my husband would make regular! My goodness does that cake look just fabulous! I’m going to need to get teh ingredients so I can make it…your pictures are making me hungry! ;D haha. Thanks for sharing! I would love to make ice coffee! where do you find caramel baking bits? never heard of them. Are they in the baking aisle? I buy them in the baking aisle at Walmart and Target…by the chocolate chips. This recipe sounds amazing! Could I substitute dark chocolate for the white chocolate drizzle? Did anyone actually make the caramel drizzel? The cake rocked, no doubt about it! Super moist and chocolaty. But I think maybe you meant 1.5 teaspoons of salt instead of tablespoons? It was so salty we had to peel the icing off the top, it was really aweful. If I ever am brave enough to do it again I think I will just stick to sprinkling a little salt over the top of the drizzle once finished and not add any at all to the glaze itself. This sounds and looks amazing! I featured it in my chocolate roundup and wanted to let you know and I also Pinned it! You can see it here! what size pudding mix does this cake take? The big box or the little box? You will use the smaller box…the 3.4 ounce instant pudding. I hope you enjoy it! Thank you so much. I would like for you to know that I made your cake this weekend and it was absolutely delish! So moist and yummy! You really out-did yourself with this recipe. Terrific! This cake looks absolutely gorgeous…. the only problem is that you always use “cups” and “mixes” that are maybe readily available where you live, but not on the continent. You are missing out of all the european people making your recipes this way…. Isn’t it possible to use grams instead, and not cake/pudding mixes but home-made ingredients? You know that there are all kinds of ingredients in these mixes, and they not always good for us? I’m sorry you feel this way. My way of baking is semi homemade, and I love taking baking mixes and giving them a fun homemade flair. I do realize that not everyone can find these ingredients, but amazon is a great place to buy hard to find items. The Caramel drizzle came out way too salty for me too! Just wanted to recommend to others to err on the side of less salt and then add as they taste test. The cake itself was great though. 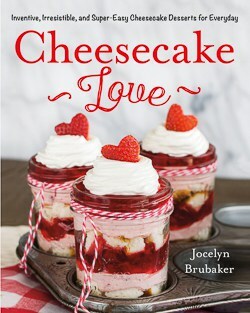 Love, Love LOVE this recipe! It is so moist and everything goodness I love in a cake. I have made this so many times and everyone LOVES it!